In a country known for its cultural treasures, the medieval town of Pietrasanta – known as the “City of Artists” —has deep roots in Italy’s legacy of art and sculpture. Located near the Italian Riviera in northern Tuscany, this little town has been a hot spot for artists and sculptors since the 15th century, when Pope Leo X ordered Michelangelo to construct a road from the coast below Pietrasanta to Monte Altissima, an otherwise inaccessible peak known to contain rich deposits of pure white statuary marble. 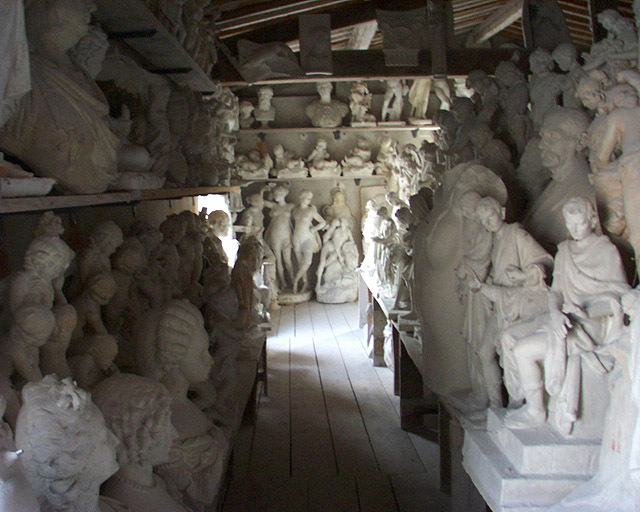 Cutting and then transporting the stone from the wilderness back to the coast proved too difficult a task to perform very often, so only the Michelangelo’s Moses and the unfinished Slaves were carved from this marble. 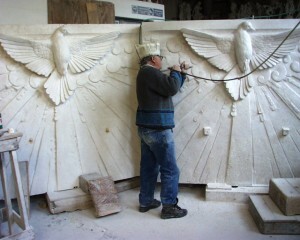 But from here, Pietrasanta’s reputation as an international center for art and sculpture was set in stone, and today artists from around the world come to use the local marble studios and bronze foundries, and to benefit from the knowledge of master artisans. And not only are these artisans highly skilled at carving stone, they also sport nifty paper hats handmade out of newspaper. Staying in Pietrasanta is an interesting experience, where you may run into Colombian artist and sculptor Fernando Botero, who has made Pietrasanta his home for part of the year; one of his bronze scuptures graces the entranceway to the town. Quirky restaurants, unusual shops, and art galleries abound, so there is always something to do. Worth a visit is the Museo dei Bozzetti which has hundreds of sculpture models by over 300 Italian and foreign artists. It also offers guided tours explaining the many “meanings” of the museum—that is, the history of local sculpture, what a model is, the contemporary artistic background and the work of the craftsmen, who are the real force behind today’s artists. You might be surprised to learn that few contemporary artists produce their own designs in stone—visit a sculpture studio and you’ll find hardworking artisans working on stone sculptures that are destined for public gardens or private villas around the world. On our walking tours in Italy that touch upon Pietrasanta, I always include a visit to a sculpture studio or a bronze foundry to see the fascinating process firsthand. I love staying at the luxurious Albergo Pietrasanta, a boutique hotel housed in a palazzo in the center of town, with a stunning modern art collection that seamlessly blends with the historic building and fine antique furniture. This is where we stay on our Cinque Terre & Beyond walking tour, which touches upon some of the more well-known hiking trails in Liguria as well as the quiet undiscovered trails that bring you to Tuscan marble quarries or tiny seaside villages. I am writing to tell you that I linked to your fabulous blog today through my blog http://www.artteachtravel.com under the word “sculpture”. I hope you enjoy my blog as much as I’ve enjoyed yours. p.s. Love your name! ha! another one you would recommend? thank you. Hi Anita – I’m an artist as well and will happen to be traveling to Pietrasanta in a few weeks. Would you have any other travel tips?